We had aerial pics of Hobbiton to discuss as well. Clearly it was still under construction and needed a few more months weathering to prepare it for filming in January. In December Tehanu went to the South Island for three weeks to check out filming for herself. Her adventures on that journey, along with photos of the country she traversed, are all here: http://www.theonering.net/features/exclusives/thesearch/chapter01.html. 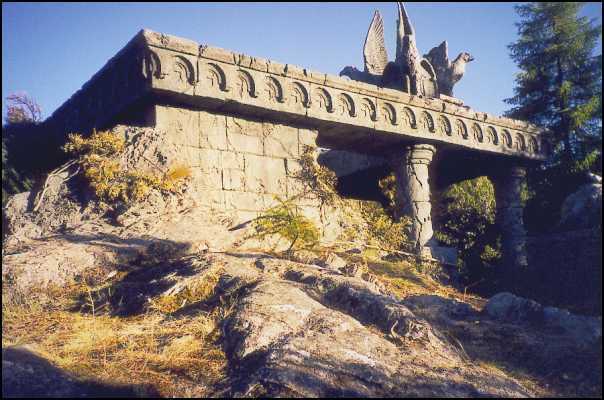 Somewhere nearby in Closeburn, an elaborate set was built that we believe is Amon Hen. The aerial shot we saw in December, swarming with stuntmen, implied that some action would happen there. Months later Scoop came up with a clear photo of the set. By January, Hobbiton was ready for filming. First the local extras did their scenes of rural life and festivities under the giant Party tree made for the occasion; then Sir Ian and the hobbits arrived to film the opening scenes of the first film, Gandalfs arrival with a cartload of fireworks. The indoors sets produced the interior scenes of Orthanc, and Sir Ian talked about his confrontation with Christopher Lees Saruman. Some Tolkien fans caught glimpses of the tower of Orthanc being built at the workshops. We heard of a brief excursion up to the hilly country of the west Waikato, near the coast, to do the approach to the Weather Hills, or something of that sort. But the actual structure shown on the preview, were not sure weve seen. From the middle of January right through to March, we got regular reports of the action being filmed almost nightly at the now-completed Helms Deep set in the quarry outside of Wellington. People spent hours watching through binoculars and the more intrepid ones braved the gorse, blackberries and security guards in order to photograph or film the action as seen from the hills behind the quarry. There were some tense confrontations.